One of my favorite aspects of Copenhagen was definitely our visit to Tivoli (You can check out other Copenhagen sights on our Copenhagen, Denmark in a Day post!) Fun fact: Tivoli is the 2nd most visited amusement park falling directly behind Disney. This is probably due to its prime location, its literally right outside of the train station in downtown Copenhagen! For our birthday presents, our parents bought our passes to Tivoli giving us unlimited rides. There is a less expensive option of paying an entrance fee and buying ride tickets but I was very glad we didn’t have to pick and chose rides based on their names. Keep in mind, most of these rides are intended for children. Thrill seekers should probably go elsewhere, but if you are a kid at heart you should try all the rides you can. We had 3 favorite rides and they were all favorites for different reasons. The Swings! Oh my goodness we loved the swings! I should probably let you know that both of us already have an affinity for swings (I’d ride them 10 times at any amusement park and still love them) but these swings were especially great. First of all they were the super high swings so if you are deathly afraid of heights they might be a no go, but remember how you are in the middle of downtown Copenhagen? The view from the top of the swings was probably the best view we had all day! If cameras were allowed there would be marvelous pictures. The swings were the first and last rides we rode because they were the best part! The Flying Trunk. The Flying trunk was a great ride for more cultural reasons. Its a simple ride where you fly around through different scenes from 32 of Hans Christian Anderson’s fairytales (think The Little Mermaid, The Ugly Duckling, etc). It was great to be able to recognize the different fairytales even if the words were in a different language, some of them even showed different endings than the American versions! The Mine! The mine ride was definitely the one where we had the most fun! The general premise is that you are riding through the mines in a mine cart and are shooting at gems trying to get more points than the person next to you. Sounds fun right? Well towards the end of the ride we came to an obstacle that we didn’t expect. A waterfall. Falling directly over the minecart path. Oh no. SPOILER ALERT! The waterfall stopped seconds before we reached it and naturally snapped a photo of our reactions! Kim and I had drastically different reactions. From our photo, you could see the sheer look of defeat in my eyes as I just sat there like “Yep, this is happening”. Kim on the other hand was not having it. She had grabbed all of her belongings, cradled them in her lap and was bent over protecting them with her body and her head with her hands. Needless to say it was the funniest part of our day. 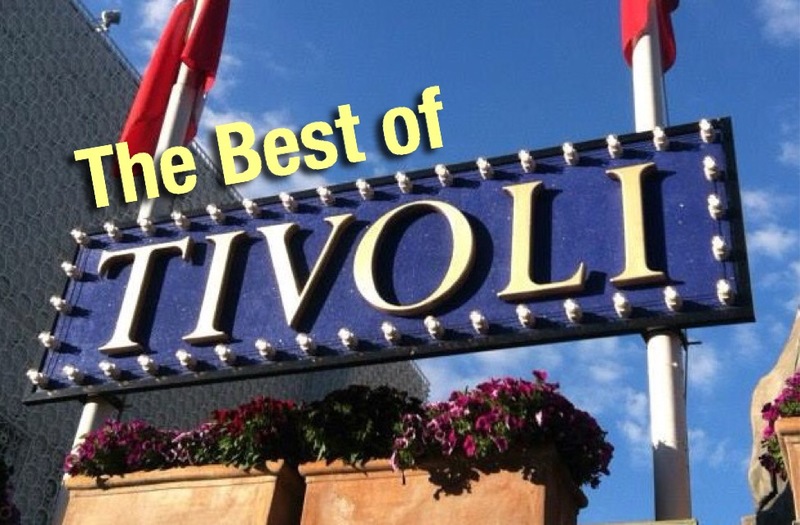 Tivoli is so much more than just these 3 rides. From the themed decorations to the yummy amusement park foods, there was something to see, do and eat around every corner of the park. We only spent the evening here but easily could’ve been entertained for many more hours. Tivoli was a fantastic end to our one day in Copenhagen, Denmark! This entry was posted in Baltic Cruise, Copenhagen, Denmark, Europe and tagged Amusement Park, Baltic Cruise, Copenhagen, Cruise, Cruise Excursion, Denmark, Europe, Schmahl World, Tivoli, travel. Bookmark the permalink.